I have a memory, from the mid 70s I think, of riding my five-gear racer two miles or so to the nearby town. I went there to hang out in the shopping centre with schoolfriends in that aimless way that teenagers do. On the way home I was passed by a group of cyclists with saddlebags and mudguards, wearing shirts bearing the slogan 'Audax UK'. Meant nothing to me. Not wanting to let them get away I overtook: "Go on lad, we've only got 200 miles in our legs". I still couldn't stay in front. Nearly 30 years later, Audax UK has grown from a hardy bunch of pioneers to a club of almost 4,000 people, and I'm one of them. More to the point, I'm a fixed wheel Audaxer. Audax UK is a long-distance cycling club, or more precisely a club for those 'imbued with the spirit of long-distance cycling'. Long-distance means anything from 200 km to, well, as far as you want to go. So much effort, so much potential pain. Why do we do it ? I guess it's addictive. A June 200 is a different matter entirely. The aim is to fly round the course, spending as little time as possible at the control points. In the summer, 200km is nothing to an Audaxer, who will have ridden 300s, 400s, 600s, maybe even a 1000 or 1200 since those early season caf crawls. The real spirit of Audax is found on these longer rides. Riding the whole length of Wales and back in a weekend, grabbing an hour or two's sleep at a control, those magical moonlit mountain night sections... and dodging the Friday night drunks in an English market town: "Look! It's a bloke! On a bike!" The elegant simplicity of the fix had always appealed to me. By the late 80s I had got hold of a wheel with a Maillard Normandie flip-flop hub... but I hadn't got on with it. In fact I'd nearly killed myself through my complete ignorance of the importance of good chainline. The Normandie was consigned to the shed of oblivion. In 1988 Sue and I moved to Yorkshire, and I started riding with the local Cyclists' Touring Club. Yorkshiremen, as you may know, have a reputation for resistance to change. And tend to show, shall we say, a disinclination to exchange their hard-earned cash for new bicycle bits. My new team-mates had always ridden fixed in the winter, that was the way things should be and they saw no reason to change. Oldtimers like these kept the spirit of fixed gear alive through the dark days of the 80s. I rode with them in the winter on my Sturmey-Archer 5spd hub, admiring the way they swooped down the descents and powered up the climbs. One day the SA-5 spontaneously disintegrated as I sprinted through the centre of Leeds, and it was time to bring out the Normandie once again. I took chainline advice and successfully joined the fellowship of fixers. Around this time, we had a series of bad winters up north and the local councils didn't stint on the road salt. Regular cyclists found that the combination of road dirt and sodium chloride would wreck their fancy groupsets in a matter of weeks. Younger club riders rediscovered fixed gear and so did some couriers. I think this marked the start of the resurgence in the UK fixed gear scene. In 1994 I moved again, this time to rural Berkshire in the south of England. My commute was now a 35 mile round trip on small gravelly lanes. I needed reliable transport, so of course I used my fix. I was riding with local clubs at the weekend, too, but fixies were almost non-existent in these Southern climes, far away from the small but growing courier scene in London. Although I kept the faith during winter, over the summer I used gears. I graduated from Sunday runs to Audax, still on gears. In 1999 I rode a summer 200 on fixed to see how it felt. It felt tough. 100 km or so was OK, much more than that was not. By the end of 2000 my Audax bike had worn out and I was planning a replacement. Somehow I didn't get round to buying one before the 2001 season started so I decided to try fixed again. A couple of hilly 100s went OK, as did a 150 and a 200. Then some more 200s. This fixed thing was going well. I entered a 300 with some trepidation but it seemed no harder fixed than on gears. If I could do 300, could I do 400? 600? I could. In fact, the longer distances seemed easier now. I still feel the same way today. I don't know if it's because I pace myself better on fixed or because spinning fends off fatigue, but give me fixed for a 600 any time--provided there aren't too many hills! I'll admit that a hilly ride is harder on a fix, and a really hilly 200 is often an hour or two slower fixed than on gears. But an undulating or flat ride can be as fast. Or faster. The zenith of my 2001 season was the London-Edinburgh-London 1400. That's a hard ride with some significant hills, but 2001 was notable for the presence of three or four other fixers. 2003 was Paris-Brest-Paris year and now there were nine of us fixers in Audax UK. (In fact, five of us from England to Paris and back as well, to make it a proper excursion.) PBP was amazing and I think it is an easier fixed ride than almost any UK 600 I have ridden. It's undulating with very few steep hills, and if I ride it again I'm definitely taking my fix. I might even consider gearing up a little from my customary 68". My abiding memories involve late-night conversations about 'pinion fix' with elderly Frenchmen in small Norman and Breton villages. Is it hard on the legs? These guys had, like their British counterparts, ridden fixed in the 50s, 60s and 70s (and 30s and 40s in some cases) but in France the tradition had died away. They really couldn't believe that we were riding sans derailleur. In the last few years there's been a real resurgence in fixed gear in the UK. Partly it's the availability of decent equipment, much of it from the US of course, but some home-grown stuff too. And partly it's the influence of the couriers. But I'd like to think that what we are seeing is fixed gear returning to its rightful place in the semi-mainstream. And for that I think we have to thank those club riders who kept the faith in the dark days. 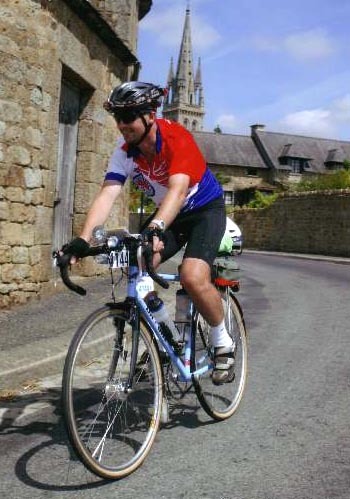 Phil Chadwick has been active on the UK Audax scene for some years. He has his own site where you can learn more about his rides and his bikes. 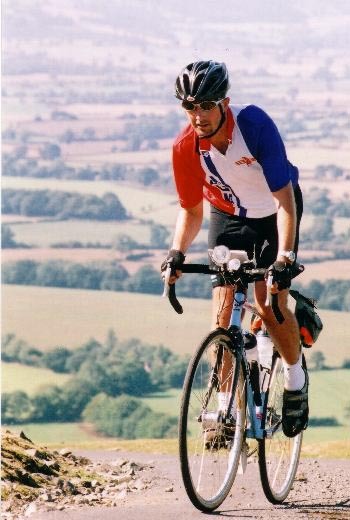 Audax UK have their own site with many resources, including this account of the 2001 London to Edinburgh round trip. More on Paris Brest Paris from the Audax Club Parisien. Kent Peterson writes amusingly about the US Audax scene on this site and his own.